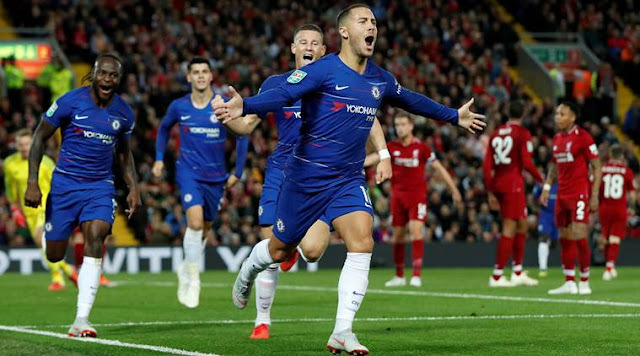 Chelsea midfielder Cesc Fabregas has revealed Chelsea can hold Eden Hazard for long after an incredible display from the Belgian against Liverpool yesterday. Eden Hazard put up an incredible performance last night against Liverpool. The Belgian came from the bench to steal the show and score a solo goal to put Chelsea through to the next round of the Carabao Cup. The Belgian international has now scored 6 goals in all competition for Chelsea this season a tally which took him till late November last season to score. His incredible form this season is catching the eye of many clubs and Fabregas has now revealed not many clubs can buy the Belgian international. Fabregas also revealed Hazard has matured a lot and he is displaying great maturity on the pitch. Chelsea plays Liverpool again on Saturday but this time it will at Stamford Bridge. Hazard will look to put up an incredible display again.